I’ll be perfectly honest. I missed most of last night’s game. We had dinner plans with Mom and had Japanese food at a nice place on the North shore of the Island. Family comes before everything including our favorite hockey team that was playing in its fourteenth game. Judging by the statistics of a somehow scoreless first period, I could tell that the Sabres dominated play. Sometimes, all you need is a great goalie to keep you in it. Henrik Lundqvist is going to the Hockey Hall of Fame for those reasons when his brilliant career ends. Luckily, we still get to have him for a few more years. He is a very prideful man. He is a perfectionist, who demands the best out of himself every night. He might be 36, but don’t tell him he can’t get the job done. Lundqvist’s 39 saves (30 the first two periods) were plenty to finally end the struggles versus Carter Hutton. At least for one night, the Rangers solved him enough scoring twice on 20 shots to defeat him and to an improved Sabres by a score of 3-1 before 16,904 at a less than capacity MSG. These days, they’re not selling out Dolan’s building as much. I believe that has more to do with not dropping ticket prices in more expensive seats, along with the ridiculous food and beverage costs. Thirteen bucks for a can of beer is absurd. It’s fourteen for tap. At the games I attend, I’m not contributing to that ridiculous price. The next one could be tomorrow when the surprising Canadiens visit. That’s because we haven’t been able to sell it. If we can’t, that suits me just fine. Montreal games are always the best due to their passionate fans who come. Most importantly, the Rangers have done something I didn’t think could be accomplished with the current roster. In a rebuilding year, they’ve managed to win three in a row. That’s called a winning streak! Cue the classic speech from Major League II. That clip will never get old. James Gammon’s Lou Brown character shall live forever. Legends Never Die! Make no mistake. Despite being largely out played, outshot (40-21) and out attempted (72-43), the Rangers aren’t giving this win back. They don’t have to. What fans must understand is that not every victory is going to be pretty. Especially with a first-year coach and young team with expectations down. Even the good teams occasionally need their goalie to steal a game. We should be thankful we have one who can still do it. By pulling out the last two games of that four-game road trip in shootouts, they gave themselves an opportunity to win a third straight time. Suddenly, they’ve pulled within one of .500. A record of 6-7-1 doesn’t sound so bad. Even if this was only the second win in regulation (the other coming at home over Edmonton), they’re doing better than most thought. In case you haven’t noticed, most of the division is struggling. Even the defending champs are. Only the Islanders are playing up to par when they weren’t supposed to. The Hurricanes have cooled off considerably. What I’m pointing out is the inconsistency we are seeing in the Metro Division. You don’t get style points for winning. Maybe this isn’t a game David Quinn will love, but when push came to shove, his team did a heck of a job protecting a one goal lead in crunch time. Once Brendan Smith handed the Sabres their only goal, they tightened up following a few key Lundqvist saves. Buffalo only got ten shots in the third including Smith’s early Christmas gift to Conor Sheary. They didn’t dominate play as much. Shots were 10-7. Let’s also credit Quinn for doing a masterful job with the 10 and a half forwards he had left to work with due to rookie Brett Howden being held out for precautionary reasons. Howden still found a way to impact the game by neatly setting up Jimmy Vesey’s first of two at the one-minute mark of the second. His goal followed up Neal Pionk’s first only 19 seconds later for a 2-0 lead. When I checked the Rangers app on my phone, I was shocked. How did that happen? Well, it did. I’m sure Quinn wasn’t happy with the lopsided first that saw Buffalo also control possession by winning more face offs. By the end of the game, the Rangers were dead even in draws, 28-28. Mika Zibanejad went 11-and-9. Kevin Hayes lost more than he won finishing 7-and-11. But they got contributions from unlikely sources, Chris Kreider (2-for-2) and Vinni Lettieri (2-and-1). Before he exited the contest, Howden was four up and four down. 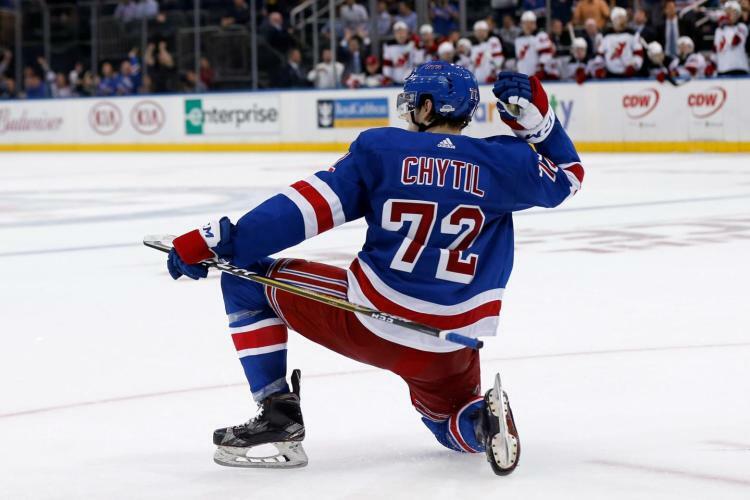 Even Filip Chytil was okay going 2-and-3. Add it all up and they offset Jack Eichel, who finished 11-and-7 without a point. They cooled off Eichel’s red hot line, victimizing him, Jeff Skinner and Jason Pominville twice during the same shift. If you can do that, you’re doing something right. That line destroyed Ottawa on Saturday, and had been on fire. Pominville had a seven-game point streak snapped. Skinner entered with 14 points (8-6-14) in his last eight games. Since Pominville was added to that line, Eichel had 12 points while racking up 11 assists over the last seven. Considering that in the first meeting, Hutton stole the show with 43 saves on Oct. 6, the two New York teams are even. There’s one match-up remaining not until February 15 in Buffalo. Maybe by then if things are better, I’ll make my first trip to a Sabres game. Regarding the two goals, both were nice plays. Pionk’s first of the season came off some good work from Zibanejad and Vladislav Namestnikov. Namestnikov made a nice pass across for Pionk, who let go of a good wrist shot that beat Hutton for the first goal of the game at 41 seconds. Quinn them sent out the Howden line. Off some more good work, Jesper Fast won a board battle to work the puck to Howden. He made a good pass to an open Vesey in the high slot. Vesey went top shelf for his fourth at 60 seconds. It was his first goal in seven games since Oct. 17 at Washington. The Blueshirts took some penalties. Consecutive minors on Cody McLeod and Smith gave Buffalo a golden opportunity to tie the game. But the penalty kill and Lundqvist came through. Astonishingly, the Sabres had the game’s first four power plays. They went 0-for-4. Fourteen of their 40 shots came on it. That’s how good Lundqvist was. Too bad I missed it. In the third, Quinn mixed up his line combinations. After giving Pavel Buchnevich less than four minutes of ice-time in the first, he increased his shifts. After sitting out the previous two games, Buchnevich was back in for the disappointing Ryan Spooner. Although I didn’t see anything until the third when we got home, I liked what I saw from him. He was more engaged, delivering a couple of checks (4 hits) while being more involved offensively. Just the kind of response Quinn was looking for. He rewarded Buchnevich by giving him a few shifts with Zibanejad and old linemate Kreider, who only played 14:06. Buchnevich received 17:07, which should silence the critics that have been impatient with a no nonsense coach, who demands more from his players. As if that’s a bad thing. Even though he didn’t register a shot, Buchnevich had two attempts and was way more physical than in his first 11 games combined. A good sign. I particularly liked the defensive play from veteran Marc Staal and Brady Skjei late in regulation. Both made good plays with and without the puck, playing the man. Staal blocked a Kyle Okposo shot that was close to going in. Skjei made the key takeaway and pass for Vesey’s empty netter from 160 feet that sealed the deal with 1:51 remaining. His two goals give him five. With a helper in the last game at Anaheim, that’s three points in two games for the hard working forward. There’s really not much more to say. They deserve credit for finding a way. We’ll see what Tuesday brings. 3rd 🌟 Brady Skjei assist, 5 blocked shots, 2 hits, 3 shots, plus-two in 32 shifts (24:50). 2nd 🌟 Jimmy Vesey 2 goals (4th, 5th), game-winner, plus-one in 21 shifts (15:59). 1st 🌟 Henrik Lundqvist 39 saves including 15/15 in both 1st and 2nd. This entry was posted in NYRangers and tagged Battle Of New York, Brady Skjei, Brendan Smith, Brett Howden, Buffalo Sabres, Carter Hutton, Chris Kreider, Conor Sheary, David Quinn, Filip Chytil, Henrik Lundqvist, Jack Eichel, Jason Pominville, Jeff Skinner, Jimmy Vesey, Kevin Hayes, Kyle Okposo, Marc Staal, Mika Zibanejad, Neal Pionk, Pavel Buchnevich, Rangers, Vladislav Namestnikov. Bookmark the permalink. I almost used a different Major League 2 clip for the last loss recap…I was getting worried Hynes would have to have to have a Lou Brown-esque heart attack yelling at them to get their attention. LMAO oh man. Well, I’m glad he didn’t. Was so excited for Boyle. What a true inspiration. On Hockey Fights Cancer Night in Pittsburgh. That was awesome! I enjoyed your radio recap. I do that sometimes too.